Find work faster! Sign up for our updates! Many companies continue to post home-based jobs and gigs that require little or no phone work. Here are 35 open now in a wide range of roles. ♥ Share the love! 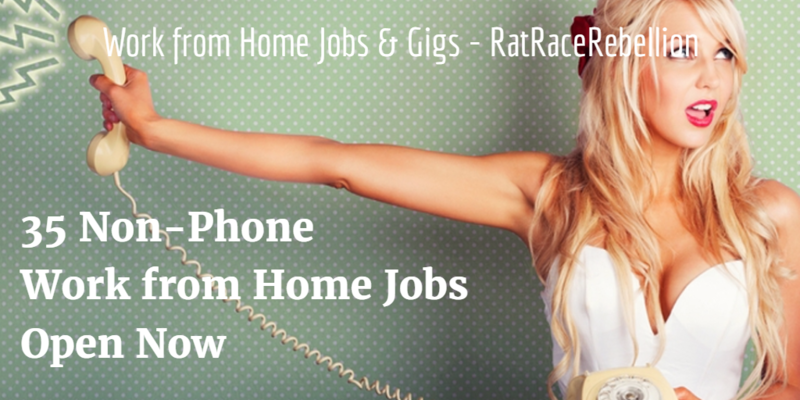 If you know someone looking for a non-phone work from home job, please share this page. They’ll love you and we will too! Thanks! This entry was posted in Non-Phone Jobs, Work at Home Jobs. Bookmark the permalink. “We Got Hired!” Congratulations to the Latest RRR Job Finders! “Welcome home!” Since 1999, we've been leading the work-from-home revolution. Our founders designed the first virtual careers training programs for the US State Department and the Armed Forces. Thousands have found jobs and gigs at Rat Race Rebellion, changing their lives and ditching their commutes. Rat Race Rebellion and Rat Race Rebels are trademarks of Staffcentrix, LLC. All rights reserved.